Marketers eager to capitalize on the strength of predictive marketing are driving their vendor partners for additional strategies and capabilities, and account-based marketing (ABM) tops their wish list. While many B2B marketers are still figuring out how best to deploy ABM, some early results combining predictive intelligence with ABM are promising. With more than one-third (37%) of respondents to Demand Gen Report’s 2016 Demand Generation Benchmark Report looking to add ABM in 2016, it is clearly a strategy that is resonating with marketers and sales teams alike as they turn their attention to key accounts. Several predictive intelligence providers have begun to answer that demand by offering additional ABM expertise to B2B marketers — whether organically or through partnerships. Michael Ballard, Senior Manager of Digital and Commercial Marketing at Lenovo North America, said he definitely sees this trend in his business. Ballard explained that account-based marketing strategy fills in the gaps. Other marketers like Ballard are seeing success with a combination of predictive analytics and ABM strategy. According to Chase Shiels, CEO and Co-founder of 4ME Group, a lead management and CRM provider, predictive intelligence layered with account-based marketing has given his company the ability to target with precision. “We’re much more effective at identifying businesses to target and also determining if someone is a fit pretty immediately on our initial discovery calls,” Shiels said. 4ME Group has only been using predictive analytics for three months, but Shiels said it has already had tremendous impact. He added that predictive has “caused us to reframe how we think about marketing and, more importantly, overall sales strategy. The biggest thing predictive has helped us with is looking at our strongest markets by characteristic rather than narrowing down on some broad stroke like a single industry. You’re more intelligent about determining where to focus.” 4ME Group works with Radius for predictive intelligence. The convergence of predictive intelligence with ABM is natural to industry experts. That bandwagon now includes several predictive intelligence companies that have recently made news with their ABM strategies. SalesPredict and Lattice Engines both recently announced they’ve debuted predictive solutions for account-based marketing. Other predictive vendors have been rolling out account-based strategies in the last six months, including Everstring, Mintigo and 6sense. The momentum has clearly been building for some time, even if it hasn’t yet been productized. 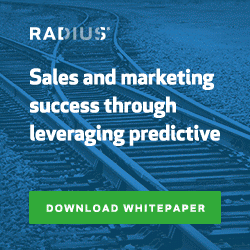 For example, at Dreamforce15, Radius CEO Darian Shirazi’s keynote presentation was titled “Predictive Analytics for Effective Account Based Marketing." During the session, he described the company’s approach as an outgrowth of predictive strategy. “People really want to find ways to use existing CRM data, external data, and software to predict which segments of customers are going to be best for them, and which segments of customers are going to convert best for them for the future growth of their business,” Shirazi said in his remarks. He called ABM “a holistic approach to going after accounts.” Because predictive gleans information about accounts, the combination of strategies is natural, he said. Shirazi detailed an example in which First Data, a major credit card processing company, was able to prioritize and segment its best B2B customer accounts on a daily basis and hand them off to its sales team by using Radius. Ballard noted that his company piloted predictive both on the contact and account layers. “We are still working through how best to use it for success but haven’t found the secret sauce yet. The company also plans on piloting a third-party data provider who can track digital behaviors and topic searches from the account level — then sync with its automation system. Forrest Leighton, VP of Marketing for Marcom Central, a B2B marketing asset management company, said he is about to run an ABM test as part of his company’s predictive lead gen strategy. “We’re architecting how we’re going to do that right now,” he said. Raab said the predictive analytics space should continue to grow as vendors expand their own data and acquire additional data sets. He said predictive is “just used everywhere,” citing scoring, customer success, general applications of machine intelligence, social monitoring, personalization, recommendation engines and programmatic ad buys as just some of the areas where predictive analytics can improve marketing results.